I've always been interested in filming locations. When I worked for Coca-Cola, I moved into a recently renovated building across from world headquarters, previously owned by Graybar, and learned that it had been used for interiors in Robocop 3. When I first moved to Atlanta, classmates told me stories about parts of Smokey and the Bandit shot along the Chattahoochee between Roswell and Parkaire Mall, and I once parked in the parking lot where Burt Reynolds pulls in to the fair at the end of that film, at Lakewood Fairgrounds, south of Atlanta. So when I read that a fan of the movie A Christmas Story had bought the house used for external locations and renovated it to its movie-shoot condition for tours, I wanted to check it out. The house is an utterly conventional 2-story wood frame house. It sits at Rowley and 11th, just west of downtown, on the edge of a gentrifying neighborhood called Tremont. It overlooks Cleveland's Industrial Valley, close enough that part of the steelyard is visible from the backyard. Adjacent to the steelyard is a site being developed as Steelyard Commons, offering the incongruous sight of a Home Depot and Target, in their typical big-box strip mall, backed up against an enormous factory, smokestacks and all. I arrived too late for the last tour of the day, but took some pictures and walked through the museum/gift shop, which itself appears in the movie -- it's the white house across the street in the movie's first scene. The interior of the house has been rebuilt to resemble that in the movie, but none of the movie's interior scenes were shot here. 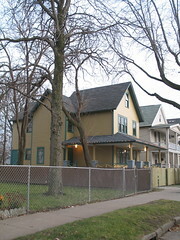 Interiors, exteriors of Ralphie's school, and the Christmas tree shopping scene were shot in Toronto. The parade scenes, scenes of the boys walking to school, Ralphie's encounter with Santa, and the Chinese restaurant scene all were done in Cleveland. The parades are on Public Square, adjacent to Higbee's, which was the department store for the display windows and Santa scenes. Higbee's has been closed for years, but there's some sort of construction underway there, as well. The Chinese Restaurant, which looks somewhat different today, is the C & Y Chinese Restaurant on St. Clair Avenue, just east of downtown. 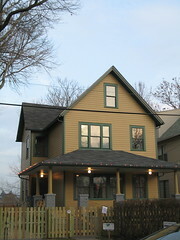 The house features a Major Award in the front window, of course. The man who bought the house is building a cottage industry on the movie -- he also sells leg lamps. The only other Flickr user to geotag their Christmas Story house pics is leanore, who had the good fortune to get pictures with snow on the ground. Director Bob Clark, fresh from making Porky's, wasn't so lucky -- his crew had to manufacture most of the snow in the movie. There's also a fairly active "achristmasstory" tag, from which I found this picture of a Flickr-er with Ian Petrella, Randy the little brother of the movie, and Scott Schwartz, Flick, the friend whose tongue got stuck to the flagpole. And here's the Major Award from inside.